Are you ready to start your career-working part time from your own home? Join our team of professional sales managers and take control of your financial life. 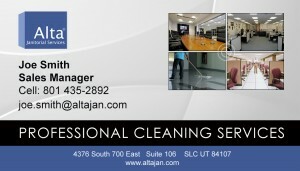 Alta Janitorial is one of the fasted growing companies in the janitorial business Utah. All you have to do is find prospect client and we will do the rest. You will receive 10% of each contract we close for the entire durations of the contract. We will provide all the training and marketing materials necessary for you to start contact building managers. How much will you make? It will only depend only you, they more you sell the more you will make. We will carefully select the right people to join our team. But it you are a self-driving professional with a few commercial contacts please don’t hesitate to contact us and for more details please visit our website. Building our team: We are looking for a small group of professionals to join our team. We have a very successful program that we are ready to expand; therefore, it is important that we continue to build our team with the right people who understand the vision that we have as a company. Training: Alta Janitorial will provide all the necessary training for you to start contacting potential clients and close contracts. The training can be done over the phone, via Skype, or you can join us for a training session in Salt Lake office. Payment: This is very simple. For each customer you refer to us you will receive 10% of the net revenue of the contract, for the entire lifetime of that contract. Payments will be deposited into your bank on the 5th of every month (unless the 5th falls on a Saturday or Sunday, in which case the deposit will be made the following Monday). Customer: We require that you maintain a log in our CRM system of every potential client that you are working with so that you will receive full credit for the contract. This also builds a database to ensure that potential clients for janitorial business Utah aren’t contacted by multiple sales managers. Marketing Materials: We will provide company brochures, a company email address (yourname@altajan.com) and business cards ($20 robux charge for 500 cards).